Water is life. We share the fate of our survival with those whom we share our water. Ultimately, that includes everyone on the planet – we all live downstream – but more directly it is those who live within the parameters of certain local and regional water systems. When it rains, water generally does one of two things. It flows on the surface into streams which eventually reach the ocean. The area that’s drained to a common outlet, such as the mouth of a river, is called a watershed or drainage basin. Alternatively, precipitation seeps into the earth, flowing underground through a permeable rock layer called an aquifer. These networks are naturally-defined areas which are intimately connected. Toxins released upstream contaminate the entire watershed downstream. Likewise, over-extracting groundwater from one part of an aquifer contributes to the decline of the entire aquifer. 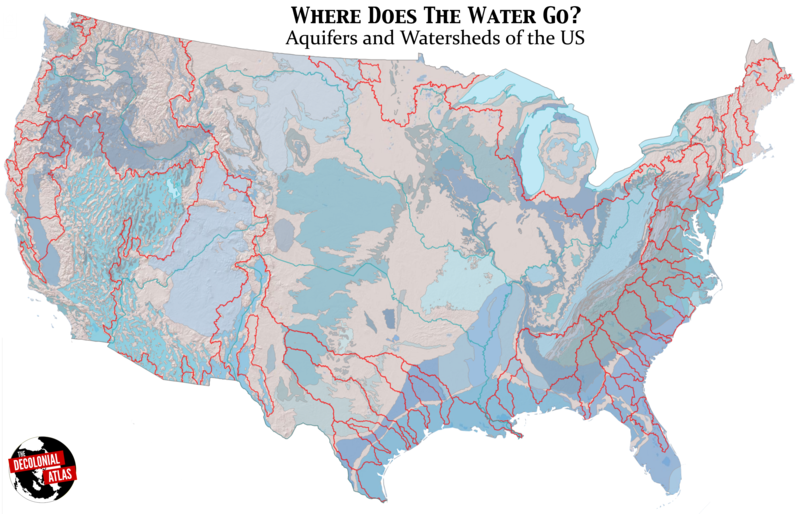 In this map of the United States, watersheds are outlined in red, and aquifers are represented in shades of blue, green, and purple. Major rivers and lakes are also overlaid to show some of the surface water features. One striking observation is that groundwater and surface water systems are largely incongruent. Surface water flowing from the headwaters of the Ohio River to the Mississippi River Delta will cross over 8 different aquifers on its journey. Where Does The Water Go was made by the Decolonial Atlas’ Jordan Engel. It can be reused under the Decolonial Media License 0.1. The drainage basin data came from the Global Runoff Data Centre and the aquifer data came from the United States Geological Survey. I’m interested in buying a decolonized world map with indigenous names for major cities. What’s your contact info? So water stops at the Canadian and Mexican borders? So glad you acknowledged this! We would have loved to map this for the entire continent without those borders, but couldn’t find the aquifer data to do that.